Seventeen high school students participated in Camp Cornerstone in 2017. Last summer, Northwest AHEC partnered with local school systems and hospitals/medical centers in their 17-county region to support 23 one-week Camp Med summer day camps, reaching 345 high school students. Northwest AHEC provided technical assistance and $1,500 in funding and various supplies for each of the 345 Camp Med participants. Northwest AHEC’s service area includes 17 counties. Camp Cornerstone, one of the 23 distinct Northwest AHEC Camp Med programs, is a collaborative effort of the Cornerstone Healthcare Foundation; Guilford, Davidson, and Forsyth counties; Thomasville City Schools; High Point Regional Medical Center; and Northwest AHEC. 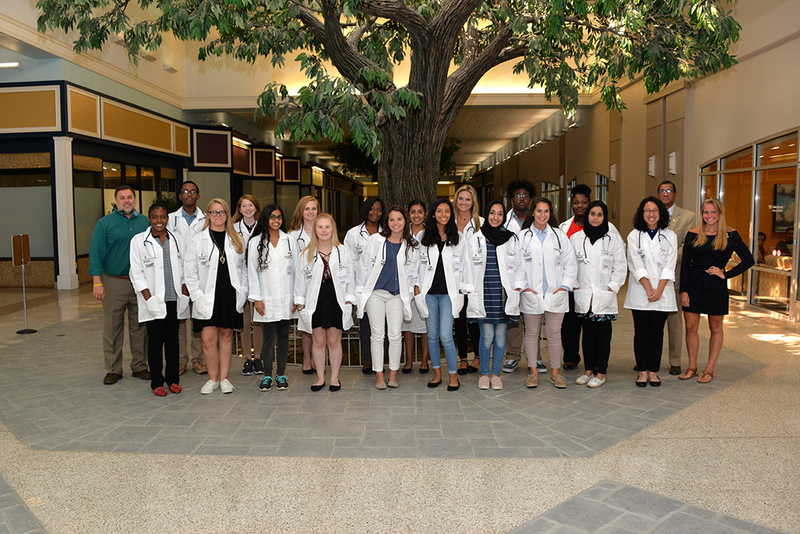 Coordinated and hosted by the Cornerstone Healthcare Foundation, the camp gives high school students interested in medical careers an opportunity to learn about a variety of health occupations by shadowing health care providers and engaging in hands-on basic skills activities. One day of the week-long camp offers a behind-the-scenes tour of various departments of Wake Forest Baptist Medical Center. Health care professionals from departments such as the Simulation Lab, Cardiac Cath Lab, Wake Forest Institute for Regenerative Medicine, AirCare, and others shared their educational journey and skills, giving students a look into their future in health care. Pipeline programs like Camp Med prepare students to be future health care professionals. One former Camp Med participant, Erin Saner, MSII, is now a double alumna of Wake Forest who envisioned, founded, and co-chaired the Boomer Share the Health Fair. The fair has provided free health screenings for the rural communities of Wilkes and Yadkin counties for the past two summers. Read more about Erin Saner and the Boomer Share the Health Fair in this AHEC Story.